Showing results for tags '소원'. [MV Review/Theory] Time For The Moon Night : A story about friendship and death? GFriend made a comeback in April 30th with the title Time for the Moon Night. Composed by Noh Juhwan, the song has sad lyrics with melodic dreamy type of song. The MV also directed by Yoojeong Ko who is associated with Lumpens film production, known for great films such as BTS, Wondergirls, IU, Jessica and many more. Now that we have seen the Time for the Moon Night music video, it is very different from their past MV. Concept, director of photography, set, the feeling when we watched this MV is very fresh and new to us. Yoojeong Ko who directed the film put a plot story that is very interesting too. She put a story that is hidden inside but made it meaningful. She pointed out and show how importance about friendships, encouraging, special memories and reminiscing. Maybe some of you didn’t noticed some details but if you look very closely, you will able to realize some things. Let’s look first in every details of the story! In this screencaps, every members are in different locations and having individual activities. The first 30 seconds of the MV shows every individual scenes. Eunha is in dim room looking to fishes Umji is outside in the playground and sitting in the arm bar, playing with paperplanes SinB walking on an empty road in wide field Yerin sitting alone in an empty room Sowon inside an elevator near the river Yuju carrying flower and stuffs at woods These scenes indicates that they are currently in the present time. According to their outfits, they are living individually and having their own agenda. Obviously they are not together and looks very sad. The director put their individual scenes that is all about the present time. In order to understand every plot of story, the director include scenes that is in the present and past. It is all about ‘reminiscing of memories’ Reminisce? What is the connection of past, present and individual scenes? First, let’s separate each of member’s story and let’s look in every details. Yerin’s story: She missed someone In this scene, Yerin is sitting alone in an empty room with boxes around her. She looks very lonely and sad. You will notice every boxes are all taped and closed while the box in front of her is not. It seems like she can’t move on something and she feels very depressed. Why she’s in an empty room with boxes? These boxes indicates she is leaving soon or going to a far place. Her important stuffs are all packed and other unnecessary things will remain in the house. In this second screencap, the tape is seen above the box (left part) so meaning to say, the box in front is very important to her so she don’t want to close and put masking tape on it. As she opened the box, she saw some old stuffs. She picked the tape recorder and tried to listen to it. In order to comfort her feelings, the scene indicates she wanted to reminisce those memories in the past by listening to the tape recorder. Is this connected to somewhere else? Is she missing someone? Who she wanted to see? Maybe some of you didn’t notice the other stuffs in the box. Inside the box, there is a long knitted pink blanket and books. This was connected to their friendship in the past. Yerin who tried listening to the tape recorder, her expression suddenly changed. Yerin missed her friends. Suddenly the present time was cut and replaced with a group of people. The first time all members are together entering an old house where they always used to visit. This indicates their bonding time and frienship in the past. They all look happy and excited when they see always each other and being together. It seems the old house is their favorite place to stay in all day and night. In this scene, they are all comfortable and sweet to each other. Seems they used this place for bonding, playing or even staying when they are bored and lonely. Does really the present time connected to the past? Take a look at her stuffs. There is a pink knitted blanket included and it is the same blanket that Eunha used in the past scene. The past scene suddenly cut and the present time appears. The tape recorder indicated their bonding moments before. As she reminisced those memories, she ended up crying while listening to it. Next individual story is from Sowon. Sowon’s story: Getting some fresh air, wanted to recall something In this present scene, Sowon is going somewhere outside at night and thinking deep thoughts. She looks very sad also. It seems a place that has river between the city lights that is far away. These scenes indicates she wanted to free her mind and getting some fresh air so she took the elevator. Probably the feeling she wanted to go back or want to reminisce the past by looking on the far city where she used to live in before. 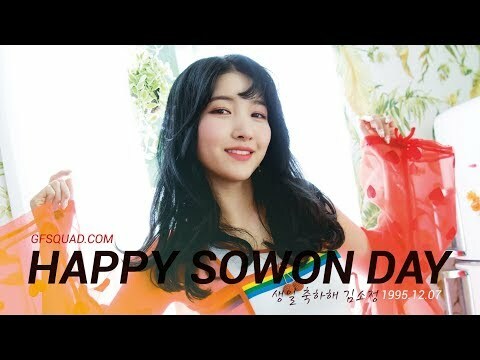 There isn’t much present scenes of Sowon but in the past, she used to be happy with her friends. There is a scene where she gave encouragement to members. Yerin who is leaving soon and felt very sad. The feeling of leaving and going to a far place, Sowon is always there to comfort her. It seems like the two understand and relates to each other. Sowon who still stays positive in the end. Next story is Yuju. Yuju’s story: Mourning someone that is very important to her The present scene where Yuju carrying flowers and important stuffs while going up to woods. It seems she is visiting someone who is already dead. If you will notice the surroundings, it is a place that has less trees with lots of trunks behind her. These indicates the place is somewhat devastated. It seems she visited a grave where there is someone passed away because of fire or maybe a disaster. She offered flowers, a treasure box and a bunny stuffed toy beside the stones. Could this be related to one of the members? To mourn a friend who passed away, she also fly up some balloons to give respect. Because of sadness, she even calling out someone by shouting Yedura!! (Hey Kids!) Because she is having hard time from her hurtful emotion. Seems like she need a comfort from her friends. Next story is Umji Umji’s story: Wanted to send a letter message by using paperplanes This present scene shows that Umji is having alone time. She also sitting above the arm bar at the playground. This is her individual scene that is no any people playing besides Umji. The paper planes has drawings and messages included. This is probably she wanted to send a letter to someone she is missing or far away. Compared to past scene, Umji is having fun with her friends and she even have sisters who can help and guide her whatever she does. While past scenes are showing, suddenly the present scene appears where Umji jumped off from the arm bar. It seems she are done playing with paper planes in that day. What more strange is she already have many bruised and scars, indication that she has many band aids on her knees. The question is why she kept doing this? It seems like she always staying up in that place and still playing paper planes. The bruised knees with band aids indicates she is still a kid, that seems weak inside when alone. There’s no anyone can help and encourage her to stand up in that time even she is feeling empty inside. Next individual story is SinB. SinB’s story: Going back to a place where she still missing it Seems far away from home, SinB is having alone time too. Where is she going in dusk afternoon? The scene indicates SinB wanted to reminisce the past. It seems she always knows the right path that she’s going through. She wanted to go to the house they always used to stay and even also the wide field that they used to run and play. She is known to be energetic, who loves to run always. Seems SinB always take the lead when it comes to directions. SinB knows every places around the area even in the wide fields. She was the first one who discovered the old house too and brings her friends to play. These are their running scenes. It’s already night and she finally found the room they used to play together with her friends. When she opened the door, you can see nothing but empty and dark room. The place they always used to stay was already an abandoned house. The present scene suddenly replaced with past scene. Same as night, all members showed up and filled with lamps that has dim light. From dark empty room, it was now replaced with dim lights. This is now the scene where all of them are playing fun. There is also a scene where SinB and members playing a heart number game. It seems SinB came back to a place where she want to reminisce happy memories together with members. Last story will be Eunha. This has left many speculations about Eunha’s true identity or condition. Some pointed out she is already dead or a ghost. This is a little trick from the director of how can we analyse Eunha’s role in this MV. We got confused in the first place because of what she acted through the entire film. What did really happened to her? Eunha’s story: She is mentally ill, she has severe mental health condition In order to understand where this came from, let’s take a look in every individual scenes of her. In the present scene, Eunha is staring out the windows, looking to surroundings like nothing. She was zoning out and looked very blank inside a dark room. Like the other members, she is alone too. In the first place, why would she close the curtains when it’s still bright? Seems like she don’t want to be seen by any people or she is having a social problems. She is acting very strange in the beginning. Instead, she went to the table, sat comfortable and stares to the fishes inside the little jar. Within the small room, and being dark, she feels calm watching it. When the past scene showed up, she acted the same way. She looked blank as always. Same in this scene, she is going somewhere she even don’t know. Without control, she has no idea what she doing until her friends found her and walked together. SinB who knows the path, leads all the way. Then she realized it was her friends who called her, she felt at ease and happy now. Another same scene during night where they are playing in the grass fields, Members have flashlights and one member is missing. This is the scene where Eunha suddenly acted strange again. She was lost for a moment until the members found her out and was sitting alone in the field. Their expression looks very worried as they saw Eunha. In different scene, Eunha is acting strange as always. While doing the game, she felt that her friends were suddenly gone for a moment. She looks very lost and confuse in her expression. There is a scene members pointing out flashlights to her face, whether she is daydreaming, confused or absent-minded, Eunha’s expression still the same. She’s still looked distracted. Why Eunha is always acting strange? Why she looked so confused, lost or absent-minded? What did the director do to make it connected to Eunha’s real condition? If you will look closely in the very beginning, Eunha is standing alone in a room. Her outfit seems different and looks like she’s wearing a hospital gown. If you will check the Melon story update, where they revealed some behind the scenes photos from the MV, you will see Eunha wearing a simple hospital gown. Yes, Eunha has health condition and she is a patient who is staying in that room. But why the room looks like a normal house? If you will notice every detail of the room, it has minimal stuffs such as chair, lamp, and simple bed. In the Melon story a photo included with a sign board written above which says ‘Yang Hosil’. The room is called as a clinic or a room for patients who need infirmary treatment. Infirmary care includes people who are sick and ill. They are under observation or need to monitor about health conditions. Whether a person can’t manage to take care of own health, or having hard time maintaining his/her condition, the person will be under Infirmary. Unlike normal hospital, it has limited capabilities. Infirmary is a place where the infirm or sick are lodged for care and treatment. It is not intended for patients requiring to stay in a long time. They will directly be send to Hospital. This is an actual image of a clinic or infirmary room. This means Eunha is having a problem within herself. Whether she’s so depressed, having social problem or memory loss, she is under treatment in that room. The present day where she is staying in a place was probably no one can look and care for her since her friends are already far away and having their own lives. The past scenes explained why she is in a poor health condition. The scenes of absent-minded, lost in the way, daydreaming are the symptoms that she is not in normal condition that’s why her friends are always there for her. All members know and understand her real condition. They are used to it. In the end, members gave her the most attention. Comforting her, lots of affections, being accompanied wherever she goes and finding her first that’s why she was most loved by the members. No reason in the past why did they end up separate like what happened in the present scene. the director didn’t include the details but it was more focused in their happiness, bonding and what real friendship means. The director made the film very tricky, hidden and confusing. All in all I really love this MV because it is really about friendship over problems. Despite having problems, they didn’t care about it but they chose to be positive and happy together. This is also the first time they act like from movies. It’s definitely fresh and new from the past MV. There is a lot of interaction and affections to each other. Now let's watch the whole mv. It's time for the moon night now!